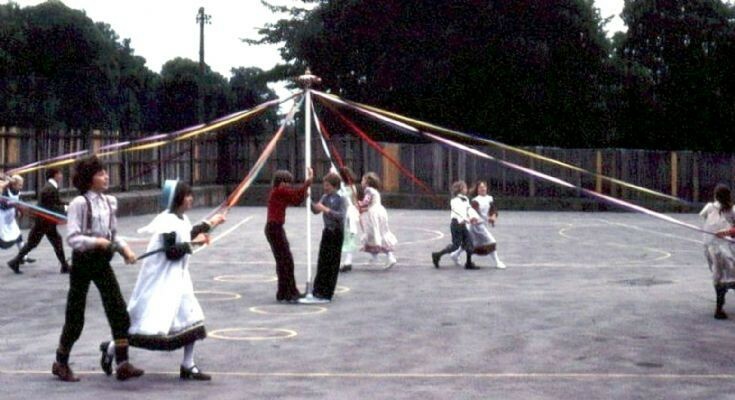 At the Handcross School centenary celebrations in 1978 there was a demonstration of maypole dancing. The photograph appears to show a dress rehearsal for Class 1. The Large Version shows country dancing which was also featured at the event. In the centre background I can spot Betty and Sid Sargent. Further to the right is my father, Roger Ray, with a camera case chatting to me, and then Eileen Leadbetter in a white-fringed dress with her husband, Royston “Roy” Leadbetter. This photograph was probably taken by Derick Gordon. Select Open Document to view two pictures of Class 3 rehearsing country dancing under the guidance of teacher, Mrs Peggy Harrison.